Today is the Catholic Feast of the Guardian Angel. Of course the concept of a Guardian Angel is not exclusive to Catholic Christians. Angels have fascinated humans since we stood upright and began to think instead of react. Many faiths embrace angles, Christianity, Islam, Judaism, Buddhist (Devas) and Hindu (Spirit Beings). And of course Angels have become a central focus in non-traditional spiritual beliefs too. Not unlike discussions of late, is their a God, and if so, what form does this supreme Spirit take, the Guardian Angel opens up a wide degree of interpretation. The image above struck me as the perfect Guardian Angel for the Knights of Moleskine, Spirit and Ale. 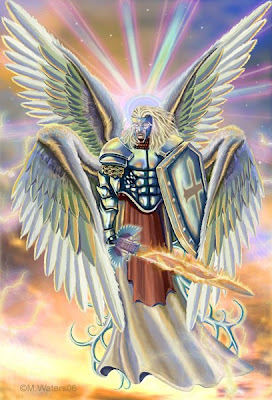 This is how many view the Archangel Michael, the warrior who defends us from the powers of evil. Of course, then there's the Guardian Angel that is nurturing, more feminine, who watches over us as children, keeping us safe and secure during a scary night. Then, the Guardian Angel that is without body, omnipresent, detached but always present. It seems to me that like everything else, our Guardian Angels take on the persona that we project on them. Like beer, sometimes we're in the mood for a mellow lager, sometimes a hearty stout, sometimes a hoppy ale; so too our Guardian Angel, sometimes mellow and nurturing, sometimes a hearty warrior, sometimes a bitter yet satisfying aftertaste. The picture above was taken by me behind the altar at the Dome, the home of the nuns of St. Benedict in Ferdinand, Indiana. 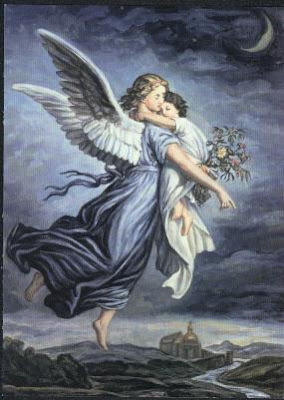 I have always embraced this image as one of my favorites of my Guardian Angel. A warrior, yet approachable, open and wise. I have this image as my main background on my iPhone. Of course, it in reality is a reflection on how I view myself. I came to believe in Guardian Angels long before I became a Catholic Christian. One night after late studies on my return home from University to my trailer in the woods overlooking Kentucky Lake, I fell asleep at the wheel, literally. When I awoke my car was driving itself through the woods, steering to avoid one tree after the next until it came to a crashing halt, perfectly wedged between two trees. Not a scratch on my body, yet my car was totalled. The freaky thing was, watching that wheel moving, like unseen hands where steering it away from harm. I finally made it to my bed that evening and just as I was getting ready to go to sleep a rainbow of light appeared at the end of my bed. Instead of being frightened, an overwhelming calm came over me and I went right to sleep. I knew that I was being watched over. Sir Hook, you seem to have WAY too many "wrecked car" stories. I'm sure that your Guardian Angel co-pilots are getting tired of all the crashes and picking up the pieces. Unless they "live" for that sort of stuff. 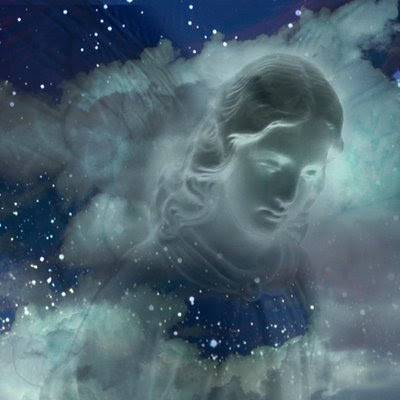 I think on some level that angels are examples of our oneness -- or never being separated. I do not have any personal memories of being saved from harm and then seeing my Guardian, but that doesn't mean he/she/it is not there. When I was very small, I did have an experience with seeing my grandfather standing and watching me -- he had passed away years before. I guess he just wanted to check out how I was growing up. I know that my father believed in angels, especially family members who have gone before. That is a comforting thought.